1 to 10 of 228. Welcome to the map gallery. We have more than 200 maps of the B.C. area dating from the colonial period and before. Most of these were included with, or filed with, the correspondence itself. Maps outlined in green have been annotated and enriched with links to placename information. A larger collection of maps is available at the UVic Libraries Early BC Maps site. Sketch of the Gulf of Good Hope (now Cook Inlet) and Sandwich Sound (now Prince William Sound) Cook Inlet and Prince William Sound. 1 item (illustrating the log of HMS Resolution, Captain James Cook, May 1778) extracted from ADM 55/120. Canada: New Caledonia (now British Columbia). 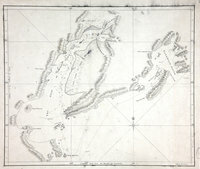 Sketch of the Gulf of Good Hope (now Cook Inlet) and Sandwich Sound (now Prince William Sound). Compass star. Sketch of King George's Sound (now Nootka Sound). Nootka Sound. 1 item (illustrating the log of HMS Resolution, Captain James Cook, May 1778) extracted from ADM 55/120. Canada: New Caledonia (now British Columbia). Sketch of King George's Sound (now Nootka Sound). Scale: 1 inch to 2 miles. Compass star. Drawn by Heny Roberts. [Nootka Sound, c. 1778]. Shows soundings. Relief shown by hachures. San Juan Boundary Arbitration. Atlas. Maps sent to Admiral Prevost at Berlin on 12 June 1872. With list. 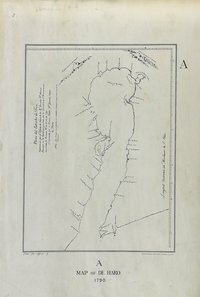 [British Columbia, Washington, 1779; 1872] Carta reducida que comprende las costas septentrionales de la California contenidas entre el grado 36 y el 61 de latitud Norte descubiertas en el ano 1775 y el de 1779 en las expediciones que de arcten? del Soberano se dispusicion para dichos des cubrimientos, las primera en la Fragata Santiago mandada por el Theriente de Fragata dn. Juan Francisco de la Bodega y Quadrs, que subio' hasta los 58' y ultimamente con las Fragatas Princesa al manida del The. de Navio D. Ignacio Arteaga y el de la Favorita por el de la misma clase dn. Juan Franc. de la Bodega y Quadra que Ilegaron hasta los 68' de latitud N y al Occidente de S. Blas 51' que corresponden a 158'-6' al Occidente de Paris. Sketch of Ahouset. Lat. 49 12N. Long. 126 12W. (Variation estimated 19 40 E.) Sketch of Ahousat. 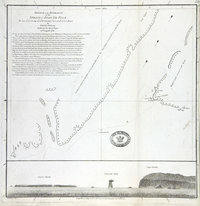 Plans of Ports and Harbours on the North West Coast of America. Published by A. Dalrymple, London. [British Columbia, 1786-1789]. By Charles Duncan, Master in the Royal Navy, 1788. Engraver William Harrison. Published Dec. 17th, 1789. 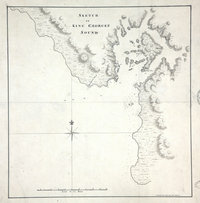 Sketch of Scott's Bay on the N.W. Coast of America. Lat. 50 38N. Long. 128 35W. [and] Sketch of Friendly Bay in Nootka Sound. Lat. 49 37N. Long. 126 48 W. Variation 18 E. Sketch of Friendly Bay in Nootka Sound. Lat. 49 37N. Long. 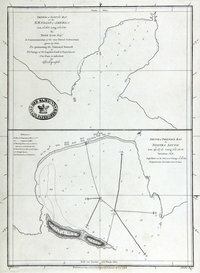 126 48 W. Variation 18 E.
Plans of Ports and Harbours on the North West Coast of America. Published by A. Dalrymple, London. [British Columbia, 1786-1789]. Two maps on 1 sheet. Scale 1/4 of a nautical mile. Sketch of Friendly Bay shows locations of First Nations dwellings and a reference key. 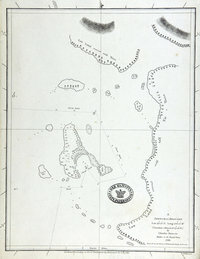 Sketch of Scott's Bay has inscription: "To David Scott Esq. In commemoration of the very liberal instructions given by him for promoting the national interest in the voyage of the Captain Cook & Experiment, this plate is inscribed by Dalrymple." Published according to Act of Parliament by Dalrymple, April 4th, 1789. 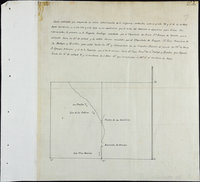 San Juan boundary dispute maps [map A]. Map of de Haro 1790. San Juan boundary. Atlas (set of maps marked 'A' to 'O'). [Juan de Fuca, Strait, 1790; 1873]. Title supplied by cataloger. Series consists of reprints of either complete or parts of maps originally published between 1790-1859. All pertain to the San Juan Boundary dispute. Published by Harrison & Sons, Photo-Lith. St. Martins Lane [London 1873]. [Map A]. Plano del Estrecho de Fuca reconocido por el Alferez de Navio de la Rl. Armada Dn. Manuel Quimper : en la Espedición que hizo con la Balandra de S.M. de su mando nobrada la Princesa Rl. en el año de 1790. Levantado por su Primer Piloto Dn. Gonzalo López de Haro. (A. Map of de Haro 1790). Relief shown pictorially; Identifies coastal features in Spanish along the Straits of Juan de Fuca including the Canal de Lopez de Haro; Includes notes; "A. "; Scale not given. 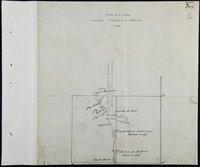 Plans of Ports and Harbours on the North West Coast of America. Published by A. Dalrymple, London. [Juan de Fuca, Strait, 1788; 1790]. By Charles Duncan, Master in the Royal Navy, 15th August 1788. Published Jan. 14th, 1790. J. Walker, Sculpt; W. Harrison. Descriptive text contains some comments on the Indians of Cape Claaset (Cape Flattery, Wash.). It also includes a drawing of Pinnacle Rock (Fuca’s Pillar, Wash.), off the cape.